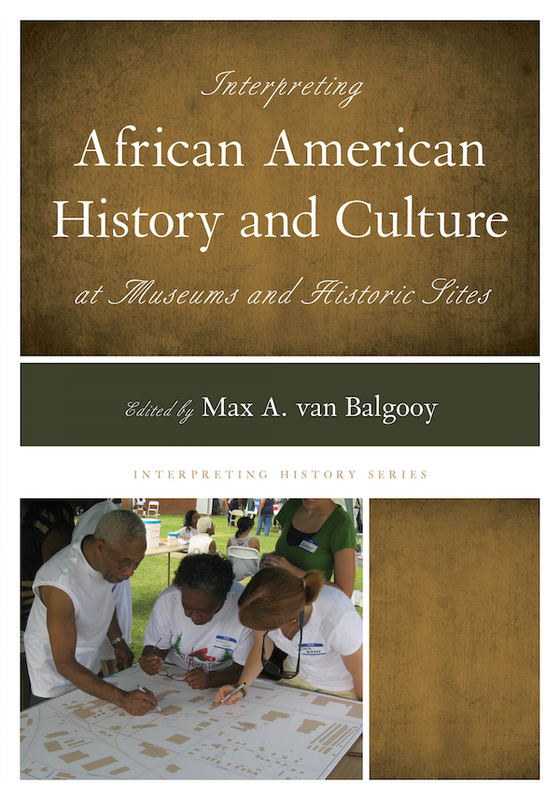 My book, Interpreting African American History and Culture at Museums and Historic Sites is now at the press and will be available in December from Rowman and Littlefield. I’ve been assembling it for the past two years and just completed the index, so now it’s firmly in the hands of the publisher. This book is part of a new “interpreting” series launched by Rowman and Littlefield and the American Association for State and Local History. Also released this year are books on topics that include slavery, Native American history and culture, LGBT history, and the prohibition era. If you’d like to order a copy of any of these books at a nice 25 percent discount, use the code 4F14MSTD by December 31, 2014. Interpreting African American History and Culture at Museums and Historic Sites is another step in a path being laid by many people for nearly 150 years. Although much has been accomplished at museums and historic sites to enhance and improve the interpretation of African American history and culture, we’ve also learned a great deal and discovered there’s still more to be done. This book suggests some future directions, organized in three sections. 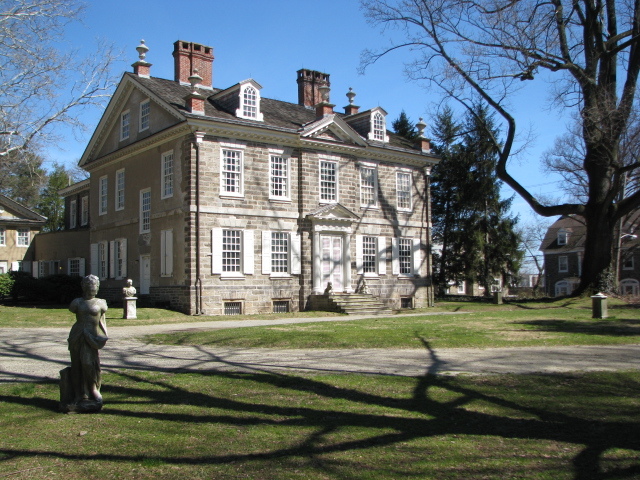 Cliveden, the country home of the Chew family in Philadelphia, Pennsylvania. The first section lays out some of the current challenges in the interpretation of African American history. Amanda Seymour shares her observations of tours and programs at the homes of the first five presidents to provide a baseline for the essays that follow. The next two essays by Kristin Gallas, James DeWolf Perry, and Julia Rose help address slavery and other sensitive or difficult topics, which often cause many museums and historic sites to hesitate. They originally appeared as technical leaflets in History News and are further expanded as separate books in this series. David Young describes Cliveden’s efforts to more fully engage the surrounding neighborhood in African American history, giving his executive director’s perspective on the benefits and conflicts. Michelle McClellan opens the next section on research. Although it’s often claimed that it isn’t possible to interpret African Americans because there’s no information, she shows how much can be learned by examining Dr. Tann’s visit to treat the family’s malaria, a brief episode in the Little House in the Prairie books. Bill Peterson reminds us to question assumptions in historical interpretation. By conducting original research, he uncovered a mistake made more than a century ago that revealed the enslaved childhood of Sarah Bickford, a business leader in Virginia City, Montana. Teresa Church, Matthew Pinsker, Bernard Powers, D L Henderson, and Martha Katz-Hyman show how research into community, the law, churches, cemeteries, and material culture open up entirely new sources for understanding the African American experience. Lynn Rainville encourages us to consider Facebook and other social media as ways of conducting research, an approach that can be easily adopted by museums and historic sites. 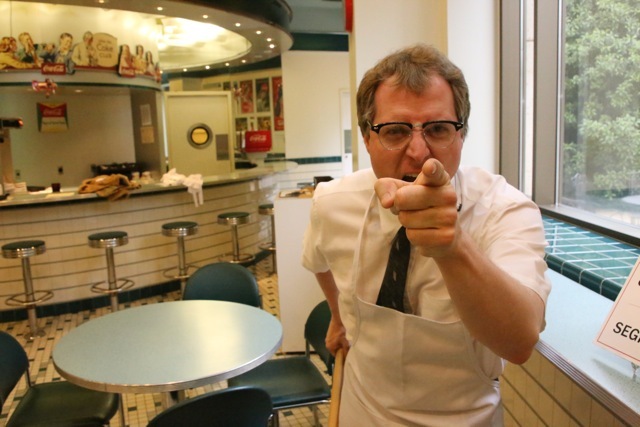 At the Atlanta History Center, students encounter “Lester Maddox,” owner of a segregated restaurant in Atlanta. Photo by Andrea Jones. The final section contains a diverse collection of case studies of successful exhibits, programs, activities, and projects to inspire ideas and provoke discussion. George McDaniel and Benjamin Filene describe how the study of one local place can make big connections to state and national history. Stacia Kuceyeski and Andrea Jones show ways to engage students in history, both inside and outside the museum. Preserving sites associated with African American history is an ongoing challenge and Jenny Scanlin and Teresa Grimes share some of the urban planning and historic preservation tools they used to protect 20th century buildings in Los Angeles. Wendi Manuel-Scott and Sara Howard-O’Brien provide an alternative to preservation in their case study of a now-demolished segregated school in Virginia. Although all of these projects rely on a collaborative approach, it’s emphasized in the closing essays. Robbie Davis reviews the award-winning exhibit on Vietnam veterans at the Heinz History Center and provides a behind-the-scenes view of its development. Robert Connolly and Ana Rea built a relationship between a museum and the local community through an unconventional service learning project (and the essay itself is a collaboration between the museum director and one of the student leaders). Ellen Spears and Shelia Washington collaborate as well on their essay, which describes a grassroots effort to interpret the Scottsboro Boys in Alabama that ultimately led to “full and unconditional pardons” to the three defendants with standing convictions. It’s a fitting conclusion to this book because it shows the tremendous impact that museums and historic sites can have when they interpret African American history. A review of the author biographies shows this book is a collaboration as well: experienced scholars, newly-minted graduates, directors, educators, historians, anthropologists, urban planners, African Americans, and non-African Americans. That diversity is intentional because the best interpretation is done as a collaboration to ensure it incorporates multiple perspectives. In interpretation, the process is as important as the product. Learning should occur not just in our visitors but also in our institutions and ourselves as we design and implement programs, exhibits, and tours. Expect change to happen. Some of those changes can be seen throughout the chapters, although they are more subtle. African Americans are not treated as a homogenous group with the same interests, motivations, and histories but as distinct individuals with names and families. The topics go farther than slavery and civil rights, travel outside the South, look at life in places other than cotton fields and basement kitchens. Not that those topics and places are unimportant to African American history, but it has to move beyond what are quickly becoming clichés of interpretation at museums and historic sites. During the past two years as I assembled this anthology, I’ve become increasingly aware of some needs and opportunities in the field. There’s a general absence of program evaluation and visitor research to help us measure and increase the impact of the interpretation of African American history, particularly in museums and historic sites outside of Virginia or on topics other than slavery and the Civil Rights Movement. Reviews of exhibits are plentiful compared to tours or school programs, but they typically focus on the scholarly content and very little on the audiences, visitor experience, interpretive methodology, or development process. Chapter 10: Churches as Places of History: The Case of Nineteenth Century Charleston, South Carolina by Bernard E. Powers, Jr. This entry was posted in Books and articles, Historic preservation, Historical interpretation, History, Social media, Technology and tagged African American history, American Association for State and Local History, Rowman and Littlefield on November 18, 2014 by Max van Balgooy. Congratulations Max, clearly this is well thought out encompassing a wide range of topics. We really need this. I expect will be a great benefit to the field. Can’t wait to get a copy. Already sent this message to several colleagues. Congratulations Max. I can’t wait to read it. This collaboration of diverse authors and expertise is exciting and should give many of us inspiration to do a better job with this content. Thank you also for pointing out the critical need to do more evaluation of the impact the interpretations are having on visitors. There is just so much we could be learning together about the impact of African American history. Thanks, Conny! And just to be sure everyone else knows, Conny has a chapter on the visitor research on the interpretation of slavery in a related book in the series by Kristin Gallas and James DeWolf Perry, which is also coming out in December. It sounds like a great series, particularly this edition. The promo code you list isn’t working though. Maybe it’s just not active yet? Thanks! There was a typo in the promo code: I confused a 1 (one) for an l (lowercase L). It’s fixed in the post and just to confirm, the discount code is 4F14MSTD (four-Frank-one-four…). Thanks! I’m looking forward to reading it, and I’m glad to learn of this series as well. Thanks so much for posting this excellent introduction to the book, Max. I continue to be very impressed at the range of authors and subjects you’ve assembled for this book, and Kristin and I can’t wait to read what our fellow contributors have to say in their chapters. Congratulations on getting this book out–can’t wait to have this on my desk to read! This promises to be a great text for many classes!